It's Saturday. 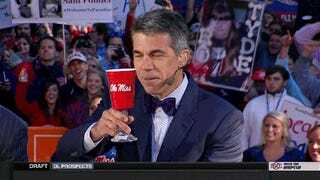 College GameDay is in Oxford. SEC Nation is in Starkville. (There's probably soccer being played somewhere, too.) The rest of your Saturday crew will be here shortly. If You Foul Jeremy Lin, Does He Not Bleed?